Bioengineers from the University of California San Diego (UCSD) have developed a 3D bioprinting method that integrates natural materials which produce lifelike organ tissue models. The UCSD team used their method to create blood vessel networks capable of keeping a breast cancer tumor alive outside the body as well as a model of a vascularized human gut. 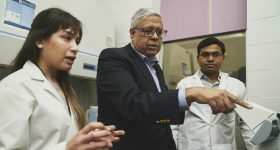 The research, recently published in Advanced Healthcare Materials, aims to accelerate the production of human organ models to be studied for pharmaceutical drug screening. “We want to make it easier for every day scientists—who may not have the specialization required for other 3D printing techniques—to make 3D models of whatever human tissues they’re studying,” said first author Michael Hu, a bioengineering Ph.D. student at the UC San Diego Jacobs School of Engineering. Last year, UCSD researchers additively manufactured a framework of functional blood vessels using a Digital Light Processing (DLP) method with hydrogel and encapsulated cells. Recognizing the importance of blood vessel networks in transporting blood, nutrients, and waste around the human body, UCSD engineers also developed 3D printed tissue that mimics the liver in terms of structure and function. Now, UCSD scientists have developed created an “easy-to-use” technique to produce long‐term culturable ex vivo vascularized tissues. Using a commercial 3D printer, the researchers are able to print a scaffold out of a water-soluble material known as polyvinyl alcohol. Following this, a thick coating made of natural materials is poured over the scaffold which is then cured, solidified, and then flushed out the scaffold material inside to create hollow blood vessel channels. The insides of the channels are then coated with endothelial cells (cells that line the insides of blood vessels). Cell culture media is then inserted through the vessels to keep the cells alive and growing. “The models would be more advanced than standard 2D or 3D cell cultures, and more relevant to humans when it comes to testing new drugs, which is currently done on animal models,” added Hu. (L-R): Bioengineering graduate student Michael Hu and undergraduate student Xin Yi (Linda) Lei construct a vascularized gut model using their team’s new 3D bioprinting technique. Photo via David Baillot/UC San Diego Jacobs School of Engineering. 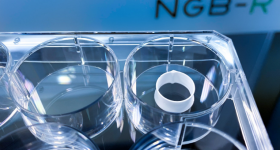 The 3D bioprinted blood vessels are made from materials such as fibrinogen – a glycoprotein that circulates in blood – as well as matrigel, a gelatinous protein mixture required for optimal growth of cell culture. “We wanted to use materials that were natural rather than synthetic, so we could make something as close to what’s in the body as possible. 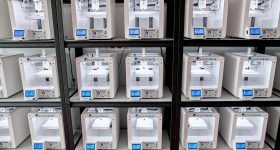 They also needed to be able to work with our 3D printing method,” explained Bioengineering undergraduate student Xin Yi (Linda) Lei, a co-author on the study. “Facile Engineering of Long-Term Culturable Ex Vivo Vascularized Tissues Using Biologically Derived Matrices,” is co-authored by Michael Hu, Amir Dailamy, Xin Yi Lei, Udit Parekh, Daniella McDonald, Aditya Kumar, and Prashant Mali. Amir Dailamy, a bioengineering graduate student in Mali’s lab, designs a scaffold to 3D print. Photo via David Baillot/UC San Diego Jacobs School of Engineering. 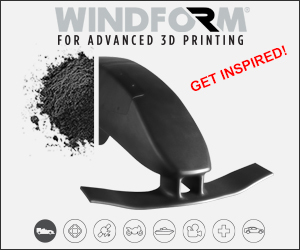 Stay updated with the latest medical innovations in additive manufacturing by subscribing to our free newsletter. Also, follow us on Twitter and like us on Facebook. Featured image shows bioengineering graduate student Michael Hu and undergraduate student Xin Yi (Linda) Lei constructing a vascularized gut model using their team’s new 3D bioprinting technique. Photo via David Baillot/UC San Diego Jacobs School of Engineering.